California has adopted the most significant climate change policies in the United States, including landmark legislation (AB 32)2 to lower state green- house gas (GHG) emissions to 1990 levels by 2020. 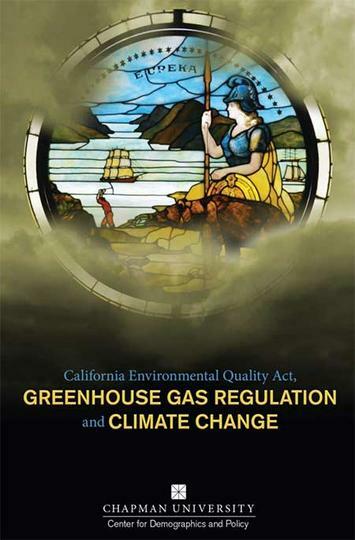 Proposed new laws, and recent judicial decisions concerning the analysis of GHG impacts under the California Environmental Quality Act (CEQA), may soon increase the state’s legally mandat- ed GHG reduction target to 80% below 1990 levels by 2050.3 The purpose of California’s GHG policies is to reduce the concentration of human-generated GHGs in the atmosphere. The United Nations Intergovernmental Panel on Climate Change (IPCC) and many other scient.c organizations have predicted that higher GHG atmospheric concentra- tions generated by human activity could cause catastrophic climate changes. other locations, is rarely, if ever seri- ously evaluated by state lawmakers or the California judiciary. Absent such considerations, imposing much more substantial GHG mandates may not only fail to inspire complementary actions in other locations, but could even result in a net increase in GHG emissions should population and economic activity move to locations with much higher GHG emission rates than California. 1. Most scientists agree that climate change risks are associated with the atmospheric accumulation of gases with high global warming potential includ- ing carbon dioxide and other gases attributed to human activity (collectively “carbon dioxide equivalent” or “CO2e” emissions). In 2011 California accounted for less than 1% of global CO2e emissions, and less than 0.065% of the worldwide annual CO2e emissions increase that occurred during 1990-2011. The state’s per capita CO2e emissions are much lower than in the rest of the United States, and comparable with relatively efficient advanced industrial countries like Germany and Japan. 2. Despite its sizable population and economy, California generates a relatively minute, and falling, share of global CO2e emissions. The amount of global CO2e emissions and atmospheric concentrations would have been virtually unchanged, even if California's GHG emissions were zero from 1990-2011, and remained at that level and assuming cur- rent emission trends in other locations continued through 2050. 3. As recognized in AB 32 and by other state leaders, California’s ability to reduce climate change risks is not primarily a function of reducing state emissions. To have any measurable effect on global CO2e levels, the state must show that CO2e emissions can be reduced in a manner that also allows societies, such as China and India, to improve the prospects for the vast majority of the population now living in or near poverty conditions. Over the last several decades, and especially since the mid-2000s, when climate change emerged as the state’s dominant environmental policy focus, California has failed to demonstrate that it can sustain a thriving middle and working class in addition to its most affluent population. 4. As sharply illustrated by Tesla’s recent decision to locate a $5 billion electric car facility, and 6,500 green jobs, in Nevada, California continues to suffer from a relatively poor global economic reputation as a place to do businesses outside high-end services and technology development. This drives even green energy manufacturing, let alone more traditional industries, from the state. State policies also reduce middle and working class employment opportunities, and increase housing and other key living expenses, such as energy costs. 5. Ironically this has resulted in a mas- sive displacement of former state businesses and residents to other locations with higher per-capita CO2e emission levels. Since 1990, 3.8 million former residents, approximately the population of Oregon or Oklahoma, relocated to other states. Billions of dollars of economic activity which might have remained in California have now been relocated to states and foreign countries with much higher emissions and weaker regulations. The cumulative net CO2e emission increases generated by the unprecedented movement of the state’s former residents and continuing loss of economic activity to higher GHG generating locations nearly offsets the GHG reductions that would be achieved in California under AB 32. Section I of this paper provides background information about historical CO2e atmospheric concentrations, the extent of global CO2e emissions over time, climate change risks associated with these trends, and California’s relative contribution to worldwide CO2e emissions. This section demonstrates that California accounts for a minute and falling share of global GHG emissions. Section II discusses the development of California’s current climate change policies and shows that, in the past, California consistently recognized that CO2e emission reduction goals must be adopted in a measured, balanced man- ner to facilitate the concurrent need for economic growth and other important social objectives. Despite recent increases in corporate earnings by Silicon Valley corporations, increased home prices to pre-recession levels, and a decrease in reported unemployment rates, California also includes the nation’s largest number and highest percentage of people living in poverty. Nearly 24% of the state’s population is impoverished according to recently released U.S. Census Bureau statistics and faces enormous economic and social challenges. The state’s ability to meet its pressing social and economic challenges could be worsened by proposed legislation and judicial interpretations of CEQA mandating much more substantial GHG reductions than even sympathetic scientific assessments have found to be unachievable using any current technology. Sections III and IV show that, even assuming that California had zero CO2e emissions during 1990-2011, and for an additional four decades projected to 2050, global CO2e emission levels and atmospheric CO2e concentration would be virtually unaffected. In fact, unrealistic unilateral GHG reduction mandates can actually increase global CO2e levels and associated climate change risks by discouraging states and countries from adopting similar policies, and by displacing people and industries to locations with higher emissions. The achievement of significant, but more realistic GHG objectives and broad-based economic and social growth would have an immeasurably greater effect on atmospheric CO2e concentration levels if the state’s economic vitality proved a workable model that also allows for the achievement of critical social aims, such as reducing poverty and improving the standard of living for the middle class and those aspiring to join the middle class.